ChennaiKalvi.com Prepared the following analysis based on the results of AUT-Coimbatore. In this following report erstwhile AUT-Chennai, erstwhile AUT-Madurai, erstwhile AUT-Tirunelvelli and erstwhile AUT-Trichirapalli are not included. Data Prepared by ChennaiKalvi.com based on Anna University Published Rank List. OTHER BLOGGERS ARE REQUESTED TO DON'T COPY THIS CONTENT. From the 109 Eligible Colleges, 22 Colleges Produced 59 Medalists. 22 Gold Medalists were produced by 17 Engineering Colleges. And also 19 Silver Medalists and 18 Bronze Medalists were produced by 13 and 13 Engineering colleges respectively. M.KUMARASAMY COLLEGE OF ENGINEERING got 1stPlace by securing 3 Gold Medals, 4 Silver and 3 Bronze Medals with 101 Rank Holders. PARK COLLEGE OF ENGINEERING AND TECHNOLOGY got the 2nd Place by 2 Gold, 2 Silver and 3 Bronze with 27 Rank Holders. K.S.R. COLLEGE OF ENGINEERING got the 3rd Place by 2 Gold, 1 Silver and 1 Bronze with 37 Rank Holders. All the 22 Colleges are listed below. 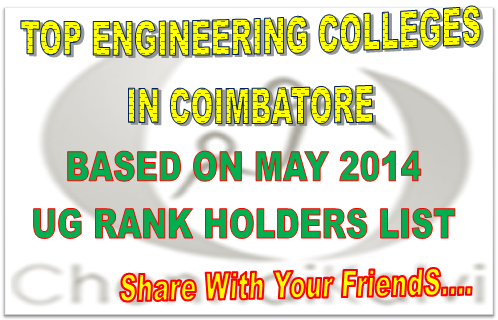 From the 109 Colleges, Out of 1045 Rank Holders the following 22 Colleges Secured 502 Rank Holders.